WISF | Eduard Strauss I.
Startseite › Research › Biographies › Eduard Strauss I.
Eduard Strauss I, b. 15 March 1835 (Vienna 2, Taborstrasse 17, ‘At the sign of the Golden Stag’), d. 28 December 1916 (Vienna 1, Reichsratstrasse 9, memorial plaque unveiled on 26 September 1991); buried in accordance with a resolution of the City Council passed on 4 January 1917 in a grave of honour in the Central Cemetery, Vienna (Group 32A, No. 42); composer and conductor; married to Maria Magdalena Klenkhart (b. Vienna, 13 July 1840, d. Vienna 4, Waaggasse 1, 16 April 1921); son of Johann Strauss I. After completing his schooling at the Akademisches Gymansium, an old-established grammar school in Vienna, Eduard Strauss wanted, by his own account, to enter the diplomatic service, but, like his elder brother Josef, was eventually persuaded by his eldest brother Johann Strauss II to take up music as a profession. He received tuition in musical theory from Gottfried Preyer, the director of music at St Stephen’s Cathedral in Vienna, for the violin from Franz Amon, the leader of the Strauss Orchestra, and for the harp from the virtuoso performer Anton Zamara, as well as practising the piano. At the benefit concert for Johann held in the Sophiensaal hall in Vienna on 11 February 1855 Eduard made his debut as a harpist, performing in Johann’s waltz Glossen (Glosses), op. 163. His debut as a conductor with the Strauss Orchestra came on 5 February 1861 at a ball given under the motto ‘Carnival’s Perpetual Motion or Dance without End’, again in the Sophiensaal hall. On this occasion there were actually three orchestras, each conducted by one of the Strauss brothers. From the start of his career Eduard’s performances were invariably measured by both audiences and journalists against the successes of his brothers, above all Johann, and there were occasions when they were judged not to be up to the same standard, especially in Vienna and in Pavlovsk in Russia in 1865. Nevertheless he continued to work unstintingly in the family business. As early as the summer of 1862, when Johann unexpectedly married and Josef had to stand in for him in Pavlovsk, it was Eduard who had to keep the business going in Vienna. After Josef died in 1870 and Johann devoted himself to composing operettas, Eduard was in sole charge of the Strauss Orchestra for more than thirty years. Under his management and tight organisation it became one of the best ensembles both in Vienna and internationally. Eduard and the Strauss Orchestra became first-rate cultural ambassadors for Vienna and Austria. For the musical services he provided for the balls and other functions of the Austrian imperial family he was in 1872 awarded the title of ‘Imperial-Royal Director of Music for Court Balls’. The Sunday afternoon concerts which Eduard Strauss gave during the winter season in the Golden Hall of the newly opened Musikverein, together with his brothers in March and April 1870 and then with ‘a newly organised orchestra’ under his sole direction from the autumn of that year for thirty years, made, according to many regular concertgoers, an invaluable contribution to the musical life of Vienna. In these concerts he performed not only the works of the Strauss family but also a great many compositions from the classical and romantic repertoire of the eighteenth and nineteenth centuries from Mozart to Wagner. At them many of his brother Johann’s compositions were heard for the first time, with Eduard – or sometimes Johann himself – conducting. In addition to his many appearances in Vienna, for example at his regular concerts at venues such as the Volksgarten establishment, the ‘Neue Welt’ pleasure grounds, or the Floral Rooms of the Horticultural Society, from 1878 Eduard went on lengthy regular tours during the summer, taking the Strauss Orchestra to Germany, as well as giving concerts with them in London in 1885, 1895 and 1897, and touring the United States and Canada in 1890 and 1900-01. ‘I have given concerts with my band in 840 towns on two continents,’ as he put it in his Erinnerungen, the memoirs which he published in 1906. These concert tours were extremely successful for both conductor and orchestra, bringing the music of the Strauss family to audiences throughout the world. In 1901 Eduard disbanded his orchestra and retired. In 1907 he organised and supervised the incineration of the enormous musical archive of the Strauss Orchestra. 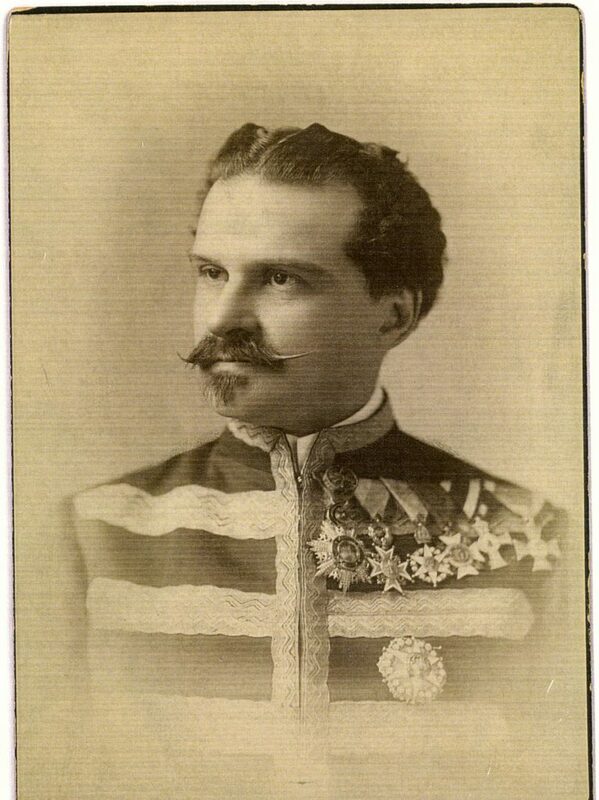 Eduard Strauss composed some 300 works, mostly waltzes and polkas, and almost all of them were published. Scarcely ten per cent of them are in the repertoire nowadays, but at least three times as many deserve to be rediscovered. In addition he made some 300 arrangements of works by other composers for performance by the Strauss Orchestra. Eduard Strauss was married to Maria Klenkhart, who was known in the family as Marie, and together they had two sons, Johann Strauss III and Josef. In 1897, when he was on the point of retiring, he discovered that his wife and sons had misappropriated more or less all his financial assets. As a result he broke off all contact with them, and also had to continue performing for another four years to rebuild his fortune, with extensive tours which took him to Germany and finally, at the turn of the century, to North America for a second time.